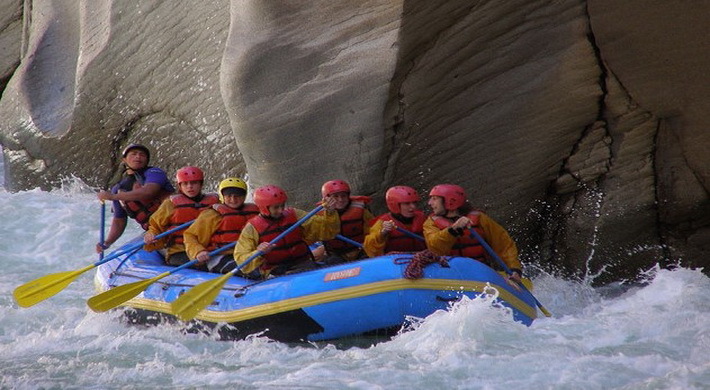 This exciting whitewater rafting expedition is rated among the best of world Class Rivers. We start our trip from Cusco 3,300 mts. driving for 4 hours across the Andes down to the Apurimac River , ( in the native quechua language meaning " Speaker of the Gods " ). This river is also the most direct source of the Amazon making it the longest river in the world .We put-in at 2,000 mts. It will take us about two hours to prepare all the equipment using only state of the art self bailing rafts and catarafts. We´ll have lunch and raft down to our first camp. All the meals are prepared by our staff on a campfire under the night sky of the Southern Hemisphere. At one point we arrive to a narrow canyon with an impossible rapid where we have to do a portage for about 300 mts. 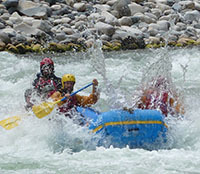 Most of the time we will be rafting class III+ and IV rapids , but we also have a few class IV + and V rapids. Among the wildlife ; in this remote and isolated canyon we could find river otters, bob cats, foxes, torrent ducks, cormorants etc. We will pick up you at 8:30 am. From your hotel in Cusco, them from Cusco we drive 4 hours through the Andes to the put-in at Huallpachaca bridge 2,000 mts.altitude. It will take us about two hours to prepare all the equipment , self-bailing rafts, oars, paddles, coolers, helmets, life jackets, wet suits etc. 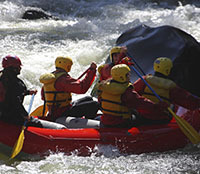 you will be given a safety talk and drills into rafting techniques. We will put emphasis in training all the participants, in how to get back into the raft, flipping the raft, swimming a rapid etc. 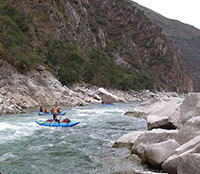 We will be floating for 2 to 3hours, doing class II and III rapids. Camp in a narrow gorge with impressive walls. Here the guides will prepare dinner; your responsibility is washing your own dish. (L+D). After a healthy breakfast we start rafting around 9:00am. Today we will be in the water for about 6 hours, doing mostly class III and IV rapids , stopping for lunch and arriving to camp around 4:00pm , today we´ll have tea time and dinner and sleep on a sandy beach under the night sky of the southern hemisphere (B+L+D). State of the art self bailing rafts. ouble occupancy tents – Safety Kayaker.